Mr Amanat Ullah Khan Shadi Khel son of Mr Ghulam Rasool Khan was born on October 21, 1968 at village Kammer Mushani, Mianwali. He graduated in 1988 from Bahauddin Zakariya University, Multan. A businessman, who remained Member, Punjab Assembly during 2002-07 and has returned to Punjab Assembly for the second term in general elections 2013 and is functioning as Minister for Irrigation. He also remained Chairman, Standing Committee on Colonies. He has travelled to Europe, UK, Dubai and Korea. 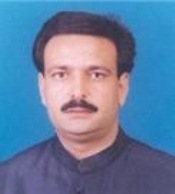 His elder brother, Obaid Ullah Khan served as Member, National Assembly during 1993-95 and is a sitting MNA.